Surgery as per ASD, plus repair of the torn rotator cuff. This protocol is based on maintaining range of movement in the first phase and then gradually building strength in the middle to the last phase. Table slide. (A) Starting position. 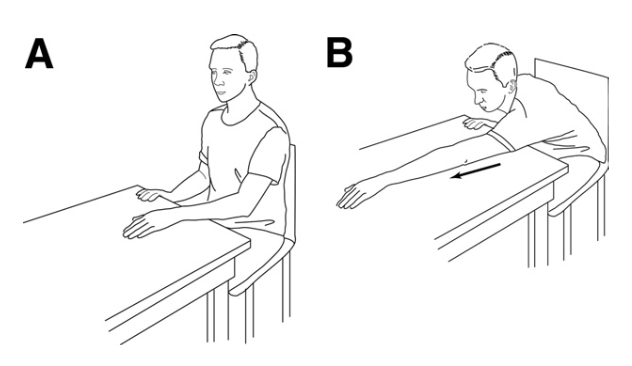 While seated at a table, the patient places the hand of the affected shoulder on a sliding surface (e.g., a magazine that slides over a smooth table surface). (B) Ending position. The patient slides the hand forward, maintaining contact with the table, while the head and chest advance toward the table. From: Prevention and Management of Stiffness After Arthroscopic Rotator Cuff Repair: Systematic Review and Implications for Rotator Cuff Healing, Arthroscopy. 2011 Jun;27(6):842-8.